Looking further afield and the breeze that pushed sailors to their boundaries on the opening day is to return on Saturday leading through to Sunday's Medal Races. At present, they are on course to strike gold again, advancing to pole position after a second in the single Women's 470 race. "There are a lot of good teams here,” explained Oliveira. "They are very fast, very smart and have been sailing 470s for a long time so there is a lot of experience. We are trying to do our best and we'll have to see what happens. In the Men's 470, the dog fight between Australia's Mathew Belcher and Will Ryan and Croatia's Sime Fantela and Igor Marenic continued. The pair have shared the leading positions over five races and are only separated by two points. The different between the pair was minimal in the only Men's 470 race and the Croatians took it by just four seconds. The biggest smile of the day in the Laser fleet was reserved for El Salvador's Enrique Arathoon who snapped up a huge victory in the sixth race. After a series of results in the mid 20s, Arathoon sprung a huge surprise taking the lead from the off and maintaining through to the finish. "I was lucky enough to win the last race,” he said through a smile. "I started at the committee boat, I spoke with my coach and he said the right looked good and I just went for it. "Winning was more than I expected but I managed to keep it and it was a nice race. Man it was tight. Lorenzo almost got me on the downwind so I was really nervous. I managed to stay calm and keep the boat moving fast and I made it first through. Tom Burton (AUS) retains the lead in the Laser and Sam Meech (NZL) climbs to second overall followed by Matt Wearn (AUS). The day's other race win went the way of Andy Maloney (NZL) who is eighth overall and 14 points off Meech, his rival for New Zealand's Rio 2016 Laser spot. The day's wins went the way of Maud Jayet (SUI) and Isabella Bertold (CAN). One physically gruelling race was completed in both the Men's and Women's RS:X fleets. Italy's Mattia Camboni proved to be the king of day claiming the bullet which positions him in 15th overall. Nick Dempsey (GBR) advanced to first overall following a fifth. Trailing him is Piotr Myszka (POL) and Louis Giard (FRA). In the Women's RS:X, Zofia Noceti-Klepacka (POL) has a ten-point advantage over Great Britain's Bryony Shaw (GBR). Hong Kong's Hei Man Chan won the single race of the day and is 11th overall. Brazil's Jorge Zarif was the standout performer in the Finn, taking a first and a fifth in the light wind. He has pulled himself into contention and is just ten points off of Jake Lilley (AUS) and Oliver Tweddell (AUS) who are tied on 27 points at the top of the tree. The Aussies are locked in a gruelling selection battle for Rio 2016. It's anyone's game as to who will be selected but with only the Finn Gold Cup and Sailing World Cup Weymouth and Portland remaining, time is running out for each individual to claim their worth. Jonas Hogh-Christensen (DEN) claimed the day's other bullet. 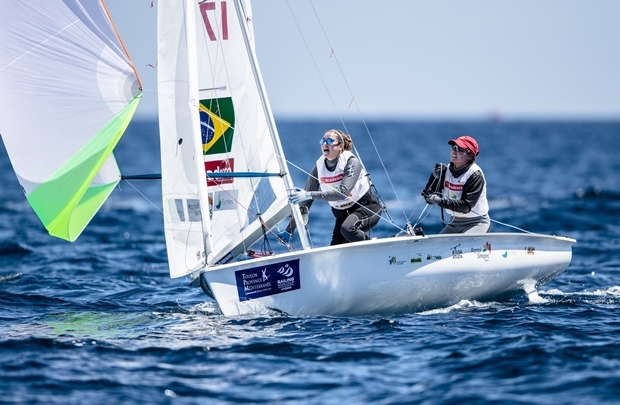 Late off the water, at 19:15 local time, the 49erFX completed four races and Sweden's Lisa Ericson and Hanna Klinga (SWE) held on with a steady day of racing. Their results, a 2-1-3-(14), leave them on 20 points, 13 clear of Annemiek Bekkering and Annette Duetz (NED). Martine Grael and Kahena Kunze (BRA) are up to third. With a bullet in the final race of the day, USA's Alphonsus Doerr, Bradley Kendell and Hugh Freund moved to the top of the leader board in the Sonar. The bullet followed two fourth place finishes and they head the field with 13 points. Closely behind with a 1-2-5 for the day are Norway's Aleksander Wang-Hansen, Marie Solberg and Per Eugen Kristiansen. A good day for the team puts them on 15 points. Slipping down to third are overnight leaders, Great Britain's Hannah Stodel, John Robertson and Steve Thomas. The Briton's could only manage a third, seventh and an eighth which they discard. In the 2.4 Norlin OD, Australia's Matthew Bugg continues to lead the way with a second, sixth and a discarded seventh. Bugg has 14 points overall. Birthday girl, Great Britain's Helena Lucas, didn't start her day, recording an 11th, which thanks to her other results she now discards. Those other results were a second and third which moves her second behind Bugg on 16 points and leave her a little happier coming ashore. Norway's Bjonar Erikstad and the improving Damien Seguin (FRA) are third on 17 points.